Larry Nassar hangs his head during the first day of victim impact statements in Eaton County Circuit Court on Wednesday where Nassar is expected to be sentenced on three counts of sexual assault some time next week. The father of three of Nassar's victims rushed at the table where the disgraced doctor was seated with his attorney during a hearing on Friday in an apparent attempt to attack Nassar. The father of three of Larry Nassar's sexual abuse victims attempted to attack the disgraced former USA Gymnastics doctor in a courtroom Friday morning. Randall Margraves asked the judge to let him have "five minutes," and then "one minute," in a room alone with Nassar just prior to bolting toward Nassar, who was seated in an orange jumpsuit at the defense table. Margraves reached the table where he was wrestled to the ground by courtroom officers. Video of the incident can be viewed below. 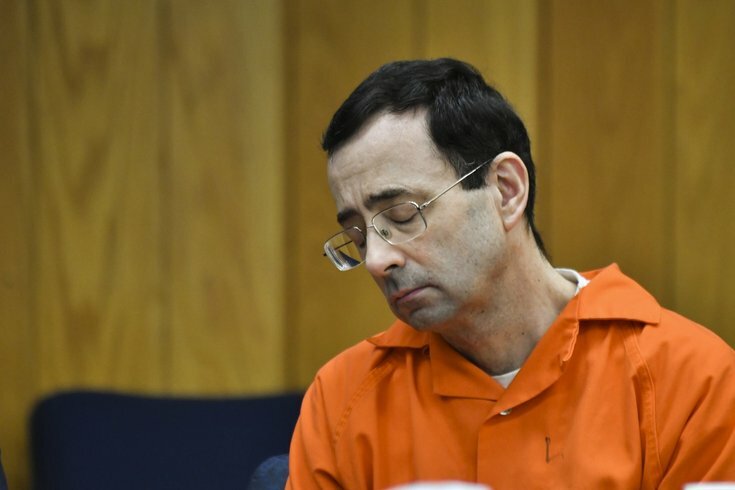 The incident took place during a hearing in Charlotte, Michigan just after two of Margraves' daughters had spoken to the judge about being sexually abused by Nassar. Nassar has been sentenced to 40 to 175 years in state prison after pleading guilty to sexually assaulting minors. After the incident, Nassar was escorted out of the courtroom and a prosecutor asked families to use words, not violence to express their feelings about the case. More information from the Associated Press is available here.